Just Finished digitizing this view of the 2018/2019 Honda GL1800 Goldwing. It took about 7 hours or so. This is 10″ wide and is for a shirt back. The smaller version for shirt fronts is available as well. This is available in my store, just specify 2018 / 2019 and you can order shirts, patches etc. NOTE: this is not “Official” Harley-Davidson™ merchandise. 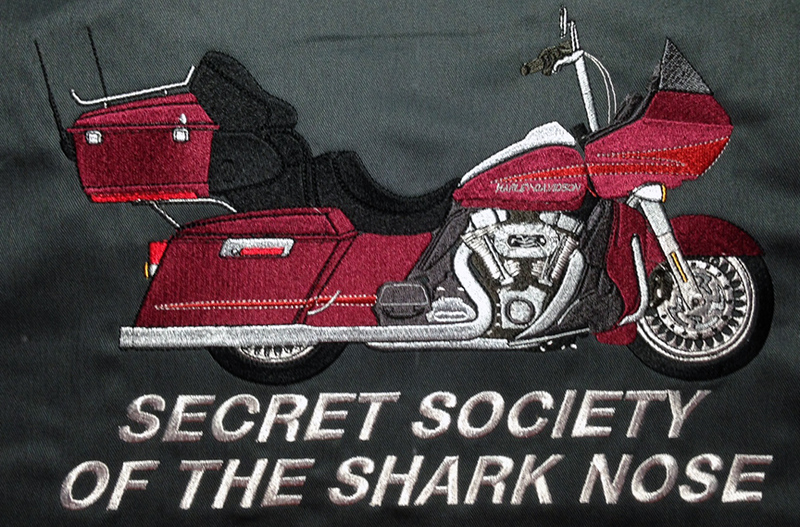 Had a customer request a 4″ patch with the Harley Davidson Road Glide Shark Nose. 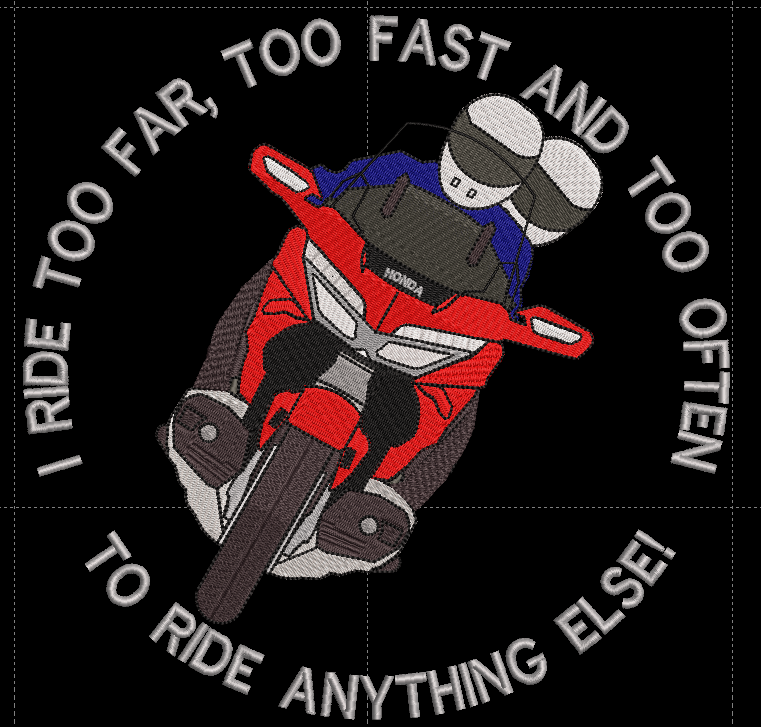 Digitized a custom patch for him where he can select the upper and lower fairing colors, the background color and the text/text color below the fairing. Up to 3 patches include free shipping in the U.S. Only $9.99 each. Each patch is made to order. 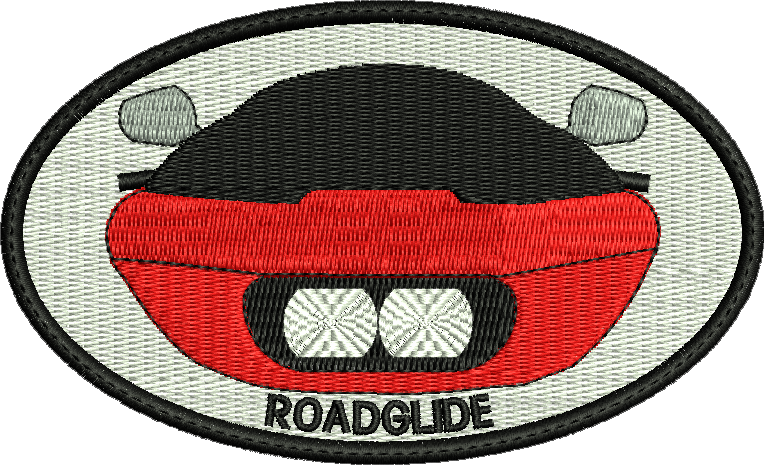 No cookie cutter pre-made patches where you have to settle for something close to your ride. I’ll try and match your colors as close as possible. This is the result and I have a version for the 2017 Road Glides as well. 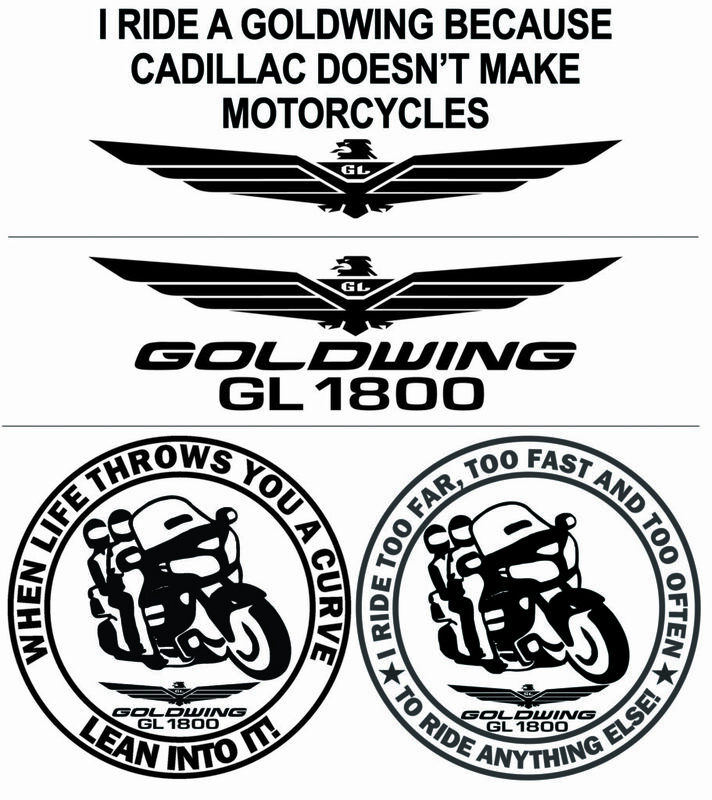 You can see these and other Road Glide, RG Ultra and Ultra Classic embroidery products at this link. Also have some BMW items, M109R items and Honda items. Stitched out a 2016 GL1800 Honda Goldwing with Red and Black paint with pinstripes. I love the paint scheme on this Goldwing. This was stitched on the back of a long sleeve denim shirt and you can see the detail that I put into my embroidery. None of my products are cookie cutter pre-made or purchased from some overseas embroidery sweatshop. Everything in my store is custom made once you place your order. I will do everything within reason to match the color and accessories on your motorcycle. The larger the embroidery, the more detail I can include. As an example, look at the detail in this Goldwing that I’m posting about. BMW KT1600 and R1200RT Now Available! 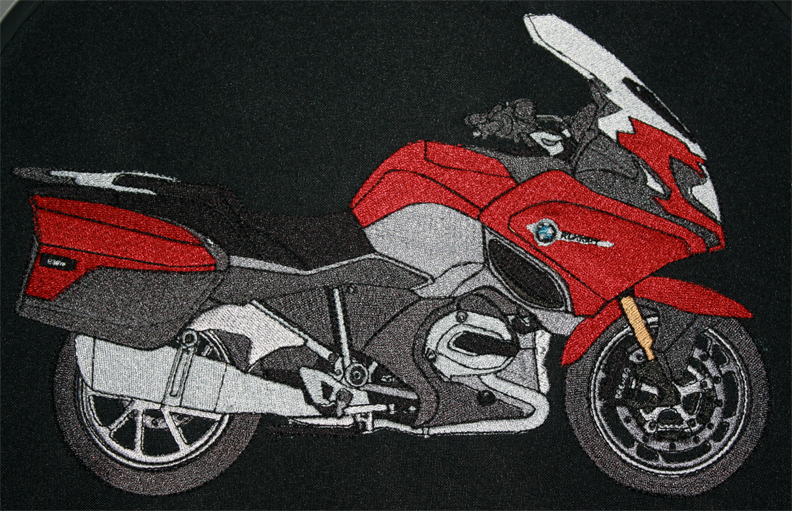 Dry Heat Embroidery is happy to announce that we have added 2 BMW Motorcycles to our embroidery stable. We now have the BMW KT1600 available and are done digitizing the BMW R1200RT. 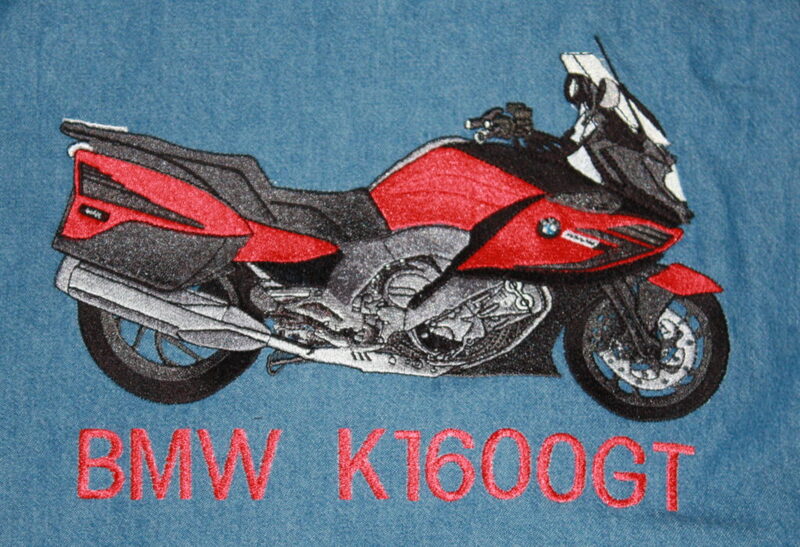 The BMW KT1600 is available for purchase right now, and the R1200RT embroidery will be available for purchase within 24 hours as soon as I do a test stitch out to make sure it’s high quailty! Here’s the KT1600 embroidery done on a denim shirt back. The embroidery is over 10″ wide. 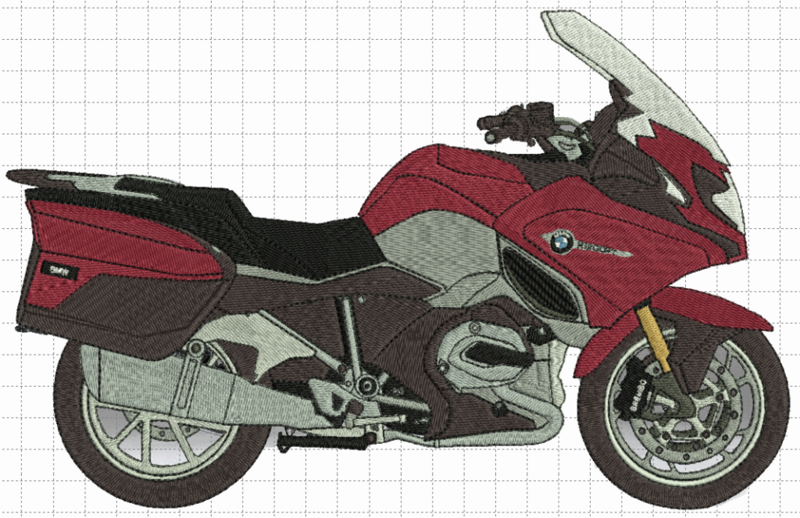 The R1200RT BMW Motorcycle embroidery digitized file screenshot is below and it’s also over 10″ wide. This image will be replaced with an actual picture of the stitch out test embroidery. Here’s the picture of the stitched out file. It’s 10.5″ wide and on black poly patch twill. You can see the screenshot of the digitized file below this picture. Are you tired of the people who are so busy talking on their phones, or texting that they are putting themselves and others at risk as they weave all over the road? 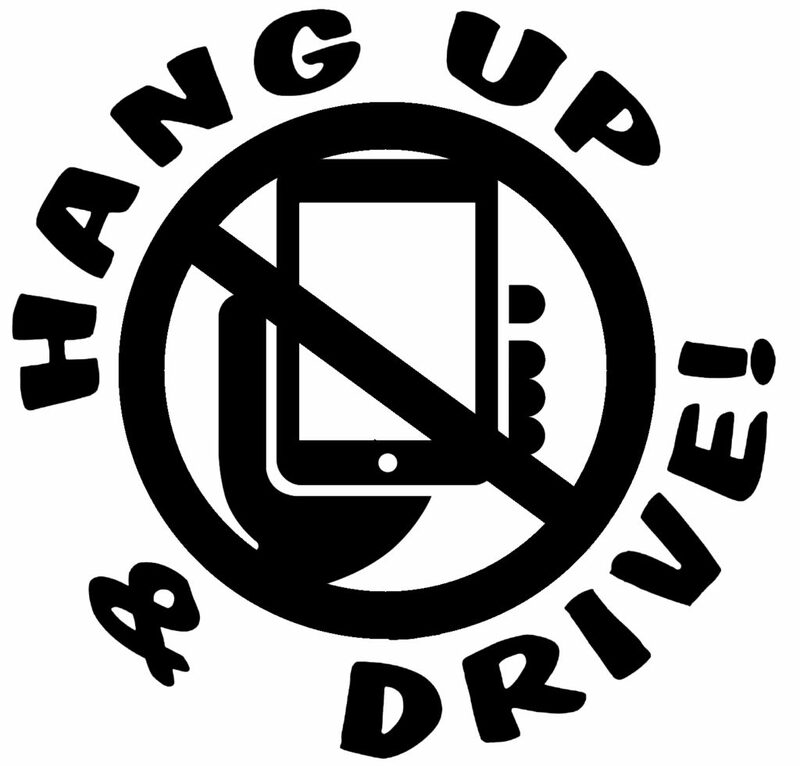 Maybe this Hang Up and Drive Vinyl decal will cause someone to actually hang up! Available in several different Vinyl Decal colors and sizes. Just click HERE to go to the Dry Heat Embroidery store and check out the other available vinyl decals. 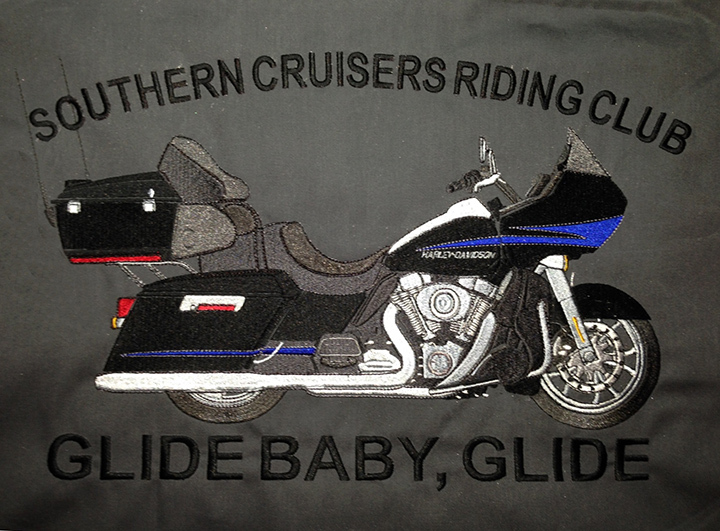 Just finished this Harley-Davidson Road Glide Ultra motorcycle embroidery on a Dickies Charcoal workshirt. The embroidery is 11″ wide by 7 1/2″ tall. 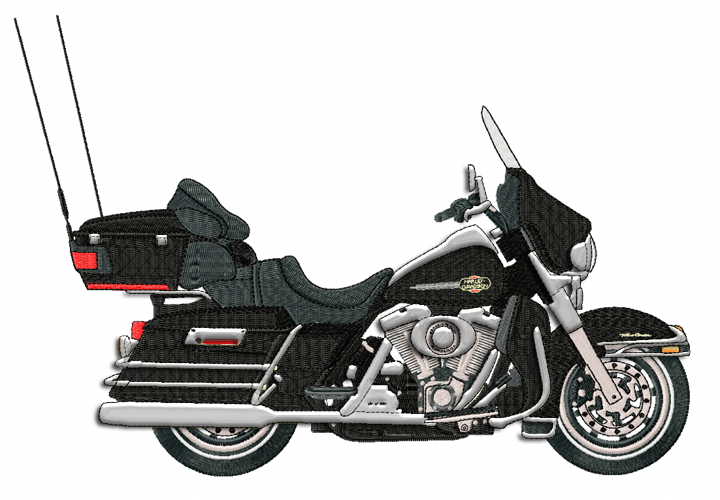 The Harley-Davidson Ultra Classic Embroidery File is Done! After many many hours of point by point digitizing using a customers picture of their Harley-Davidson Ultra Classic, the file is done and ready to be stitched. The Embroidered Ultra Classic joins its brothers, the Road Glide and the Road Glide Ultra. All of these are available to be embroidered on patches, shirts, hats and hoodies. I normally use pale yellow to identify the chrome pieces, but people keep thinking that I’m going to stitch out their ride using yellow chrome so I have used photoshop to overlay a silver chrome look to the chrome areas. The chrome on your Harley will be either silver polyester thread or you can have the optional metallic silver thread. I’m pleased to announce that the Harley-Davidson™ Road Glide Ultra is now available in the Dry Heat Store. The Road Glide Ultra can be embroidered on Hats, Shirst, Patches, Hoodies, sweatshirts and light weight jackets including High Visibility Yellow or Orange. Small changes to the bike are done at no charge. Custom wheels and larger changes that require longer digitizing time can be done but there will be an additional cost. You can change the colors of the skins or the seat and add tank bibs etc. DryHeatEmbroidery.com is continuing to add more models to embroidery garage. The Ultra Glide is about 70% digitized and should be available this month. Here’s a picture of the Road Glide Ultra on the back of a Charcoal Carhartt workshirt. 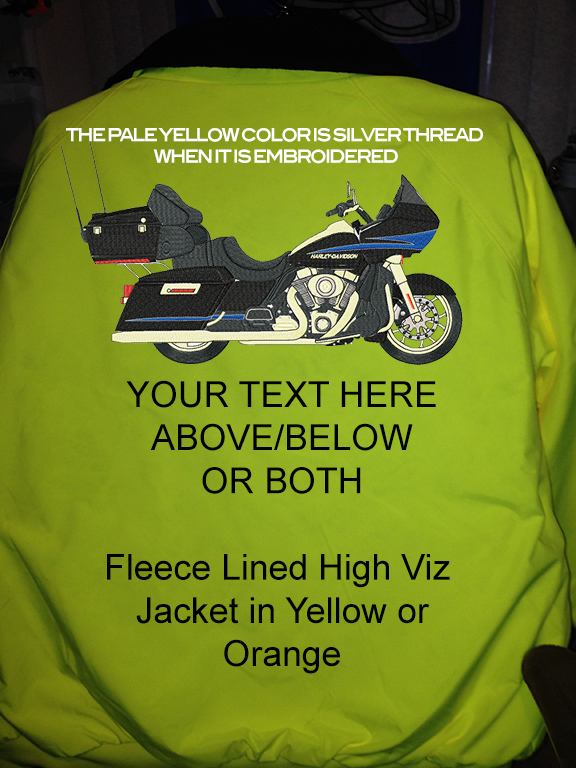 So what would a Harley-Davidson Road Glide Ultra look like on a High Visibility Jacket? 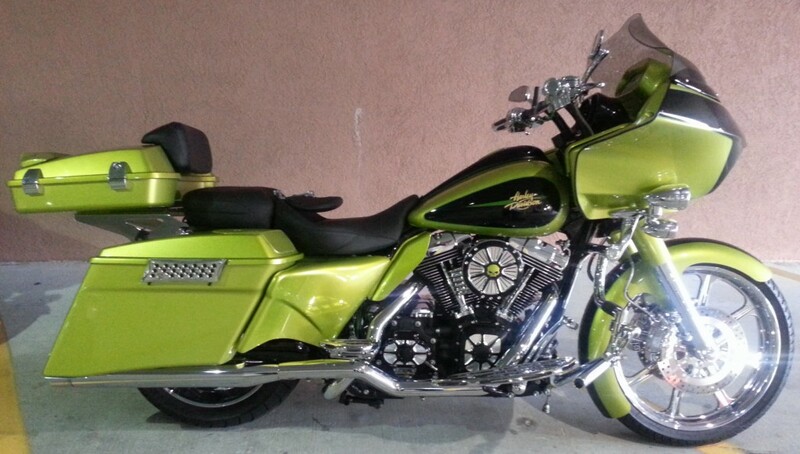 Green Custom Harley-Davidson Road Glide Digitizing is DONE! 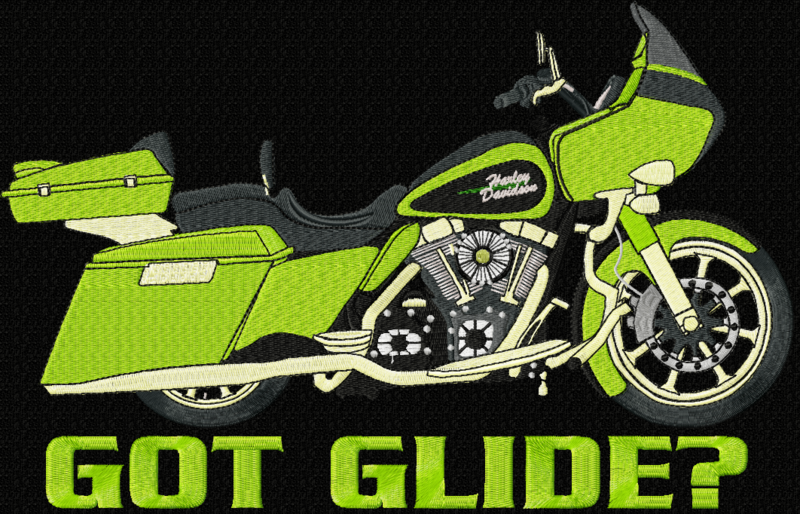 I finished the digitizing for the Green Apple colored Harley-Davidson Road Glide patch and here it is with the picture the owner sent me for comparison. It took quite awhile to make all the mods on this one so I did have to charge a digitizing fee, but I’m sure the owner will be very happy with the results. I’m still working on the Ultra Glide Classic and it’s coming along. FYI: The pale yellow color will be silver or metallic silver for chrome. I use pale yellow because there are so many different shades of gray/silver that I needed a way to clearly denote what is chrome so I know where to put that spool of thread.